No Purchase Necessary – Therefore purchasing something won’t increase your chance. The new PCH Millionaire will be announced on NBC Channel Television. “Weekly payments will continue for the life of the winner and after that for the life of one other person designated by the winner as the secondary recipient.” You know that PCH Search&Win website is the only Online Search Engine that can make you a Millionaire. Increase your chance of winning a prize by searching online at PchSearch.com or PchFrontpage.com. The 5000 Dollars a Week Forever is one of the most popular Sweepstakes from Publishers Clearing House. PCH $52O,OOO.OO Cash Upfront– Did you receive this PCH email notice? See note on the side. It has been running on the Internet since a few years now! Returning each year to please PCH Members! This year again for the winner the prize will continue after as a Legacy for a special person in the life of the winner, someone he/she loves and cares about! You’d get $5,000.00 a week for life, then after that, someone you choose gets $5,000.00 a week for their whole life! PCH $5,000 a Week Forever – Remember that you can, as stated in the official PCH Sweepstakes Rules that the Winner may elect to take a lump-sum payment in lieu of all weekly payments. Did you know that Publishers Clearing House has awarded over $246 Million Dollars to American People since their debut. PCH CASH PRIZES have been awarded since 1962. What are your dreams if you won? How about a luxury car and a brand new house or a dream vacation to Hawaii! Most of you will probably pay their bills first. What about you? But remember that with this PCH Prize “5000 a Week FOREVER”, you will not only change your life Forever but also the life of people you care about. Moreover, you would be able to leave a legacy to someone you love. The joy of giving! We did a Survey a few weeks ago asking our visitors at Online Sweepstakes and Contests on What people would do first if they won? Well the answer was that they will pay their Home Mortgage with that money. But what inspired me the most of your answers, even more at this time of year with Holidays around the corner it’s the fact most of your second answer was “I will give back to people in needs”. It warms my heart to see so many people wanting to help others. Wondering about how you could get your entry for the PCH $5000.00 a Week Forever Sweepstakes – PCH Gwy. 11000? Well, first you must register to become an official Publishers Clearing House Member. Once you’ve registered as a member of PCH great family, you will be amaze by all the entry opportunities you will in your email inbox on a weekly basis. Indeed, PCH team are sending almost everyday through their Newsletter email campaign some great opportunities to enter their sweepstakes. 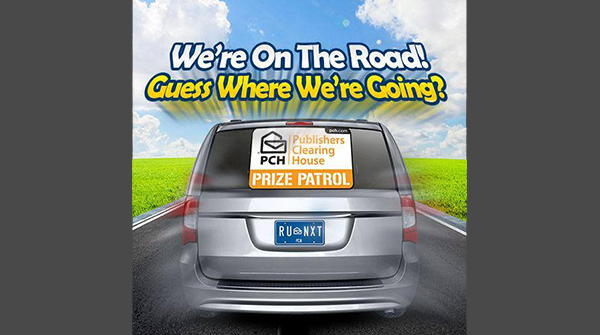 You will be able to access those sweepstakes across Publishers Clearing House Multi-Platform – Via PchLotto.com, PchSearch.com, PchGames.com or PCH.com. Don’t forget the main rule of winning PCH sweepstakes: “The more you Play and Search at PCHSearch.com or PCHGames, higher are your odds to win a PCH Prize! And be ready on the next February 28th, 2019 maybe someone you know will knock on you door and give you a Big Check, a Bottle of Champagne and a Bouquet of Balloons! Good Luck!Good Luck! Here’s for you the $5000 a Week FOREVER TV Commercial from Publishers Clearing House: PCH.com is the place to enter this amazing sweepstakes! GET YOUR ENTRY NOW! Where Is the Prize Patrol Today ? As stated on PCH Official Sweepstakes Rules:”All entries received by 11:59 P.M., ET, 2/25/19 from this Bulletin will be eligible for our $5,000.00 A-Week “Forever” Prize (Giveaway No. 11000), our $1,000,000.00 SuperPrize® (Giveaway No. 18000), a $25,000.00 prize (Giveaway No. 11937) and $10,000.00 from Giveaway No. 11936. To enter these Sweepstakes, complete the entry process. Upon timely entry, your assigned Prize Number(s) will be fully eligible to win. On days when you are eligible for multiple entries, multiple Prize Numbers will be assigned to you. Entries submitted from this Bulletin/Promotion after the deadline will be deemed invalid. The SuperPrize Number associated with the winning Bulletin/promotion that matches the winning number for Giveaway No. 11000 wins. The Prize Number associated with the winning Bulletin/promotion that matches the winning number for Giveaway No. 18000 wins. You will win a prize of $25,000.00 from Giveaway No. 11937 if you submit a timely entry from this Promotion and have the number that matches the winning number. You will win a prize of $10,000.00 from Giveaway No. 11936 if you submit a timely entry from this Promotion and have the number that matches the winning number.” PCH Claim $5000 a Week Forever Prize – Good Luck! Are you tired of entering sweepstakes and never winning anything? There are a few things you should try before given up PCH sweepstakes. This is one of the best sites to enter sweepstakes and you can do a few things to increase your chances of winning. Did you know that you could enter sweepstakes on your phone thanks to the PCH app? You should download this app and enter sweepstakes whenever you have some free time. You could do it while you wait for a doctor’s appointment or during your daily commute. This is a good alternative to logging on the official PCH website if you already have a busy schedule. Before given up PCH sweepstakes, you should try doing a few additional things to get more chances to win. PCH will give you additional daily entries for each sweepstakes you have already entered. Make sure you claim all these entries by checking your email and by logging in the PCH website or launching the app. This only takes a few minutes out of your day and significantly increases your chances to win. Make sure your “Forever” Prize Number is LOCKED inside our Winning Number Generator, along with all other eligible numbers, for the February Prize Award! Accept your Title by clicking any button from this notice to ACCEPT TITLE OWNERSHIP ROY APPEL ON TIME IN COMPLIANCE enter before the 1/24 (11:59 PM, ET) deadline and make sure your number is fully eligible to win when we select our “Forever” Prize winner in the last of a series of drawings for Gwy. No. 11OOO. YES, I’M READY TO WIN! Dear PCH, I WANT TO CLAIM MY ENTRY AND WIN $5000,00 a week for life fromPCH Gwy nr. 11000 in feb. 2019! I want to win the $5,ooo.oo A WEEK “FOREVER” and have Ny Son win also. thank YOU for the chance to enter.Maureen Mooney. Please note ROY APPEL forthcoming number’s place on the Winner Selection List must be ROY APPEL claimed by the COMPLETED 1/23 11:59 PM, ET deadline, making it a fully valid entry. Roy Appel’s Number Will Be On The Winner Selection List! for the February 28th “Forever” Prize — Guaranteed For Award! Please note forthcoming number’s place on the Winner Selection List must be claimed by the 1/23 11:59 PM, ET deadline, making it a fully valid entry. 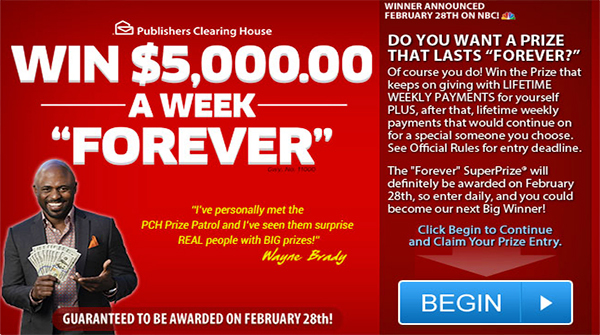 The Winner Selection List is the official Publishers Clearing House record of entries that are eligible to win the guaranteed prize of $5,OOO.OO A Week “Forever” on 2/28/2O19. All timely entries are on this list. Your timely response to this notice is required to make sure your forthcoming number has a spot on the list. Deadline strictly enforced. “Winner.” That word means everything. And now, you have proof that your forthcoming prize number will be placed on the Winner Selection List. So let me assure you, the Winner Selection List is the official list of all timely entries and the only list from which our 2/28 “Forever” Prize winner will definitely come. Plus funding has already been secured for next month’s prize payout. You see, we’re doing as much as we can to prepare for our winner of $5,OOO.OO A Week “Forever” in just weeks. All you need to do is respond by the deadline to claim your number’s placement on the Winner Selection list, making it a fully valid entry. Then, just sit back, wait for the winner to be determined and get ready for some excitement on winner announcement day. $5,OOO.OO A Week For Life, then after that, $5,OOO.OO A Week for the life of a beneficiary of your choosing — isn’t that what you really want, Roy Appel? This could be a turning point for you. Your response could bring financial security for you. Claim your number’s place on the Winner Selection List so you won’t have to wonder what could have been. Once you enter, you’ll be sent to visit PCHSearch&Win, where you can claim an additional Chance To Win a Millionaire-Making PCH SuperPrize®! Plus, every day is a new winning opportunity at the search engine where PCH Millionaires are made. We urge you to not hesitate. Be sure to use any of these special links to enter, then find out what else you could win at PCHSearch&Win when you search the Internet for websites and information you want! I,Robert would like to win 5,000.00awk forever on Feb 28 2019 ,with a legacy of love ,vip elite, exclusive pch, from gwy 11000 ,Thanks Robert Jan 17 , 2019 8:54a.m. $5,000.00 A Week “Forever” Is GUARANTEED For Award! I want to claim entry of 5,000 a week forever then after that someone i chooses will wil 5,000 a week forever also, plus a chance to win 25,000 cash extra bonus from gwy # 11002. PCH. I am claiming an entry for a win of $5,000.00 a week forever from GWY#11000 Thanks. Yes I would be greatful to be the winner of $5,000.00 forever Prize. I want to enter and win $5,000 a week for life from PCH Gwy. # 11000 in feb. 2019 ! GUARANTEED TO B AWARDED on February 28th. Yes I really wish to be a Publishing Clearing House winner yes for the 5000 a week forever prize yes I am trying very hard to do all the right things to become a winner! Thanks PCH please confirm my entry I will love to win this opportunity prize award. PCH, I truely want to win your 2019 PCH drawing for the $5000 a week for life. I have so many people and organizations I’d like to help. Thank you. I claim pch gwy # 11000 to win $5,000.00 a week forever on FEB.23rd 2019 thank you PCH TEAM. PCHSearch&Win I am claiming ownership and activate SEARCH #8, entries to win $5,000.00 A Week Forever, GWY #11000, 2/28/19, and after that, a beneficiary of the winner chooses would receive the same amount for their lifetime. PCHSearch&Win I am claiming ownership and activate Forever Prize will Definitely Be Awarded on 2/28/19, I am claiming entries to win $5,000.00 A Week Forever, GWY #11000, 2/28/19, then after that, a beneficiary of your choosing would continue to receive those same weekly lifetime payments. Please provide Prize Number to be place on the Winner Selection List. PCHFrontPage The Roads to Riches, I am claiming ownership and activate SEARCH #1, Roads to Riches, to win $5,000.00 A Week Forever, GWY #11000, 2/28/19, then after that, someone special of the winner chooses would receive $5,000.00 A Week Forever, for their life. Yes I want to win the $5,000.00 a week for life from PCH. I,Robert would like yo win 5,000.00 awk forever on Feb 28 ,2019 with a legacy of love ,2xentries from gwy 11000 ,vip, elite, exclusive, pch, Thanks Robert #2 Jan 13 2019 12:08 p.m. Yes I would love to win the 5000 a week forever it would be a dream come true for me and my family.! Instant Win Prizes Are Guaranteed For Award This Weekend! Today on Sunday by searching! I’m searching before midnight (ET) entry deadline tonight to go for as many prizes as I can this weekend, today on Sunday. tomorrow and Sunday by searching! I’m searching before midnight (ET) entry deadline each day to go for as many prizes as I can this weekend. PCH Search&Win Six more Opportunities, I am claiming ownership and active Six more Opportunities, SEARCH #5 and SEARCH #6 entries to win $5,000.00 Cash, 10/26/18 GWY #11936. I want to win this prize. Yes I would love to win the 2500 a week forever prize it would be a dream come true for me and my family.! My Last Name is not BORIN, IT IS BOIN!! I Michele Johnson Lundberg am dealing with Multiple Sclerosis and winning with PCH would make me happy. Yes I wish to win the $5,000 a week forever prize it would be a dream come true for me and my family. I am claiming the search for 2,500 a week forever superprize on October 26, 2018. I have a birthday October 21, I have 6 different searches to do to win different amounts of a prize. I want entries to win each of the prizes for my birthday present. Search # 1 of 6 to win all 6 prizes. Yes, I’m Searching! I Want To Win! Today on SATURDAY 9/29 – I’m searching and ready to instantly win 5 $50 CASH PRIZES that are up for grabs! I’ll Be Sure To Claim All Opportunities Herein By 11:59 PM, ET…I WON’T MISS OUT! YES, I WANT TO WIN! Yes I will love to win the $5,000 a week forever prize it would be a dream come true for me. Save money ,just stay to home , Just send the money the from $5,000 a week forever sweepstakes . Clint Henderson September 17 2018.i claim entry for search 1 to win 2,500.00 a week forever plus win 100,000.00 vip bonus prize. Yes I was to win the$5,000 a week forever would be a dream come true for me. Doing a search to get 2 entries for the $2,500.00 or $5,000.00 which ever it is. They can’t make up their minds as to what they are doing. I’m Searching Now! I Want To Win! Card. TEN are up for grabs! instantly before 11:59 PM, ET! Plus, I searched on Saturday and Sunday to get my daily entry to win the “Forever Prize on October 26th! 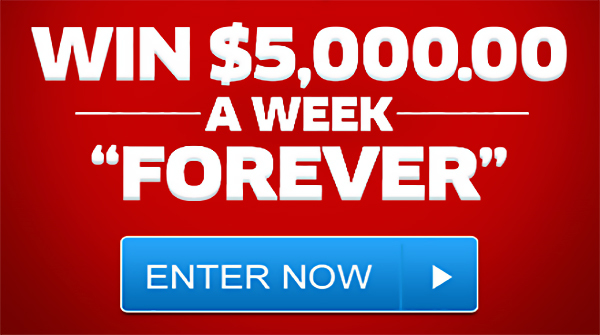 Win the “Forever” Prize by searching from one of this weekend’s official notices, and I’ll receive a PRIZE UPGRADE; $5,000.00 a week for life and then after that, someone of my choosing will continue to receive a lifetime of weekly payments in the same amount! That’s double the standard prize! And that’s not all! Continue on today and I’ll be entered now for an amazing $5,000.00 Cash Prize from Giveaway No. 11936. I’ll keep searching daily because I never know when I could WIN! PCH Decision is Final, I am claiming ownership and active Decision is Final, I accept GWY #11000 to win $5,000.00 a week forever prize upgrade from $2,500.00 a week forever to $5,000.00 a week forever prize, 10/26/18 GWY #11000. I want to win this prize. * SEARCHING NOW TO ACCEPT! MY DECISION IS FINAL TO ACCEPT TODAY’S FORTHCOMING PRIZE NUMBER BY MIDNIGHT (ET) TONIGHT. I’m Accepting My Unique Prize Number. I’ve accepted a unique prize number that could win me $5,000.00 A Week “Forever” – an Upgraded prize amount from the ongoing $2,500.00 A Week “Forever” Prize promotion (PCH Gwy. 11000)! Win from this notice and not only would I receive $5,000.00 A WEEK for life, but after that, someone of my choosing will continue to receive a lifetime of weekly payments in the same amount. Upon my acceptance, this prize number will be registered in my name in anticipation of the drawing for an October 26, 2018 winner announcement. I’m reserving this prize number in my name, by conducting a search from this notice prior to tonight’s deadline of Midnight (ET). With just ONE search, I’m letting PCH know that I’d like my name to be in consideration for the multi-millionaire-making prize that could become mine within days. Today is the last day to get in to win the Upgraded amount $15,000.00 A Week “Forever” during special Prize Upgrade Week. I Won’t miss out and I Won’t delay. 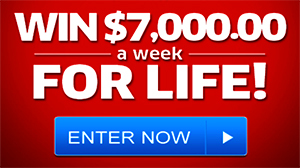 I really really want to win $5,000.00 a week for life and then $5000.00 a week for someone else. My luck just doesn’t seem to come around. Saturday 9/15 – I’m searching to instantly win a $25 Home Depot Gift Card. TEN are up for grabs! Enter me to win. Sunday 9/16 – FIVE $10.00 Papa John’s Gift Cards will be awarded instantly before 11:59 PM, ET! Enter me to win. Plus, I’m searching on Saturday and Sunday to get my daily entry to win the “Forever Prize on October 26th! Win the “Forever” Prize by searching from one of this weekends official notices, and I’ll receive a PRIZE UPGRADE: $5,000.00 a week for life, and then after that, someone of my choosing will continue to receive a lifetime of weekly payments in the same amount! That’s double the standard prize! Yes I wish to win the Publishing Clearing House 5000 a week forever it would be a dream come true for me. PCH I am claiming ownership and active to claim prize numbers GWY 11000 entries to win upgraded prize $5,000.00 a week forever SuperPrize, with 2× entries, 10/26/18 GWY #11000. I want to win this prize. PCH. I would love to claim an entry for $5,000.00 a week forever Thanks. I WANT TO WIN MORE MONEY ON OCTOBER 26TH! And even better those weekly prize checks would continue on for a beneficiary of the winner’s choosing! I say yes to the $5,000 a week forever I say yes to being the next Publishing Clearing House winner I say yes to bring it to New Jersey as regular folks can see regular folks win. I just hope to win the $5,000 forever prize on October 26th I’m playing to Win It so I’m in it to win it, so New Jersey is in the house trying to play the Publishing Clearing House. YES. YES. YES. YES! I want to win $5,000.00 a week forever from (PCH Gwy. No.11000) on October 26, 2018. PCH Search & Win… Update of the prize $ 2,5OO.OO a week “Forever” to $ 5, OOO.OO. 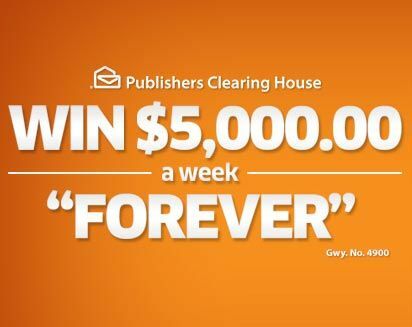 I want to win $ 5,000.00 a week “Forever” from (PCH Gwy. No.11000) on October 26, 2018. I claim ny entry for award. Thank you. Guess I hope to win the Publishing Clearing House $5,000 a week forever it would be a dream come true for me. YES. YES. YES. YES. PCH Search & Win. Claiming my entry # 5 of 50 Cash Winners from the bulletin in this exclusive giveaway. Cash Winner Guaranteed. Thank you very much. PCH Search & Win …Cash Winner Guaranteed…Claiming my entry # 1 of 50 Cash Winners from the bulletin in this exclusive giveaway. Thank You very much. Opportunity #1._ Five days in a Row, special advisory please activate my entry I claim $5.000.00 prize approval. thanks for a chance to win!! Search # 6._ 50 cash winners are guaranteed, please accept 6 x entries to Win, I am qualifued to win exclusive cash approval, I claim one of them, thanks for a chance to win! PCH Search & win. 50 cash winners are guaranteed, I claim. Six entries to win one of them Thanks! U do not have a user friendly site! Where do u enter activation code? Every time I try to do this online it can’t be done. It’s so frustrating and irritating . I would even say I hate this! I don’t know if this is going to work but my activation code is SP579!!! I’ve been entering your sweepstakes for 25 years and it’s so difficult!!!!!!! PCH Win $5000 a Week FOREVER Sweepstakes … guaranteed for award … Claim your PCH Sweepstakes entry for $5,000.00 A Week Forever Prize. … ROY APPEL WANTS TO WIN . I want to claim the official button #5 for giveaway of $5,000.00 cash prize from pch prize patrol please enter me in the drawing thank you Debra jammiedaisy @yahoo.com please come to see me soon thanks Debra,this would be a start on paying my medical bills. I Am Claiming Ownership to 5,000 A Week Forever PCH. I’m accepting this invitation. I’m going for 2 incredible winning opportunities. When I clicked continue on PCHPlay&Win I became automatically entered to win a Life-Changing $10,000,000.00 SuperPrize from PCH Gwy. No. 11000! I’m RSVP to these winning opportunities by April 20th (11:59 PM, ET) deadline. I WANT TO WIN! I’M READY TO WIN! Transfer of Funds Alert, I Am Claiming Ownership to 5,000 A Week Forever.